On a beautiful sunny gala day, people came en masse to browse the sea of marquees and wonky wallpaper tables splayed out over Leith Links – and Ace had a fantastic spot. The people next to us didn’t turn up so it became an unofficial entry point meaning we got a high level of interest. We’re proud of the groups that are a part of Ace and take every chance to promote the work they all do. 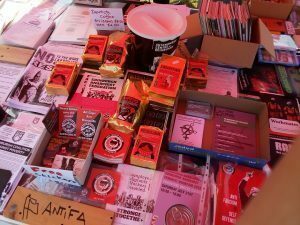 We had flyers for Ecap, Sisters Uncut, Action for Trans Health, Scottish Radical Library, Oficina Precaria, Afed Edinburgh, Edinburgh Anti-fascists and IWW as well as a few extra leaflets we brought from the centre for the day. 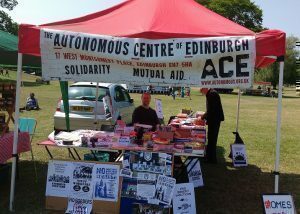 Also, thanks to all our helpers who came along on Saturday to operate the stall and pack up or deliver us to Leith. The free stickers were a big hit, hopefully because anti-capitalist, anarchist politics is becoming more important to people – we hope they stick them somewhere prominent and get the message out. The chiapas coffee and goods sold well as did the IWW t-shirts. Must remember to bring a box for the float next year. Fiddling around with pennies and fivers in a bum-bag made me panic I’d lose all our donations to the wind! It was more of a pleasant breeze but it did whip up all the leaflets – rolls of tape and old tins of beans helped weigh things down. We met some lovely people, who gave us messages of support and very kind donations which we appreciated a lot. I met two women from citizen’s advice who both said they’re having to turn people away the demand is so great, with queues growing each time they open up. The Universal Credit crapstorm has made it much worse. A man came over to talk about solidarity and what it means. He struggles to pay his rent on the wage he has and was very interested to hear about the Living Rent campaign working to cap rents and control landlords. He was unsure whether it would work though. A lot of people are like that. Interested and supportive of the different things Ace’s groups are doing but tend to be pessimistic. It’s just hard to believe good change is possible sometimes. We also managed to get some of the new leaflets from Crisis – their group ‘The A-Team’ meets every Wednesday at Ace working to advocate for homeless people. There was a real mix of stalls – from food to ‘Save Leith Walk’ and a big music stage right next to us. by admin10. Bookmark the permalink.